Tile installation might seem a straightforward and simple job yet it needs expertise and years of experience to install tiles perfectly. Especially when it comes to bathroom tiles and kitchen tile installation, the stone setter or tile installer must position them in level for water drainage. DTLA Tile offers all kind of tile installation services in Los Angeles that include floor tiling and backsplashes. Our professionals provide affordable tiling services without compromising the quality of work. Also, our experts can help you decide which type of tile would be suitable based on your application. At DTLA Tile, we believe our job does not end with successfully installing the tiles but instead we provide care guidance for new users for the longevity of the tiles. There are tons of sizes, shapes, patterns and types of tiles available in the market; however, you might need a consultation to choose the most suitable option. We provide not only competitive prices but also provide free consultation services to our clients. Why DTLA Tile for tile installation in Los Angeles? Whether it is tile flooring or backsplash installation, our tiling experts have years of experience in the field and being locals; they understand the climate of Los Angeles. DTLA Tile is known for its superior yet efficient tile installation solutions. We do our best to use resources efficiently and not wasting clients time and money. We always deliver within the budget. Our consultants can do the cost estimation for you. This way you can choose the tiles based on your budget. This realistic approach allows you to find the overall cost of redesigning. How to calculate tile installation cost? As mentioned above, our consultants provide in-house cost estimation services, but you can make a rough estimate yourself. Before we move to the actual cost calculation part, let’s see what factors affect the overall cost. Type of the tiles – Obviously, the type significantly affects the overall cost of the tiling. However, with thousands of options available, you can choose the tiles according to your budget. Labor cost – It varies from location to location; for example, the labor cost of tile installation in Los Angeles would be different than the labor cost in New York or some other city. Old flooring – That is the thing many people forget to consider. You are installing new tiles, what about the old flooring? Whether they are tiles or carpet or something else, it would cost to remove the old flooring, and this cost depends on the old flooring. Accidental damage – Some tiles always get damage because of the transportation or during the cutting process, no matter how carefully you try. That’s why we recommend buying 10% extra tiles to cover that. Now we know everything we need, let’s estimate the cost based on a hypothetical scenario. To make things simple, we are assuming the kitchen is perfectly square with 15 x 15 feet dimension. That would be 225 square feet. Let’s suppose the tiles you are installing cost $2 per square feet and the installer would charge $3 per square feet. The labor cost is simply assumed for clarification; mainly it depends on the size of the project. For example, the labor cost of a 200 square foot project would be significantly higher than the cost of a 5,000 square feet project. Also, things get a little complicated with your kitchen (or other application) is not a rectangle. If there are a lot of corners, then the installer would need to cut the tiles perfectly, that means many parts of those tiles would go to waste. There are many other scenarios where your cost estimation could go wrong. That’s why you need a professional opinion for cost estimation to prevent unpleasant surprises. We at DTLA Tile not only provide tile installation services but also try to convey the knowledge we get from our years of experience. The better informed you are, the better decisions you can make and get things done your way. Let’s see few things about tile installation you should know. You need to visualize everything in the actual setting to get a proper idea. 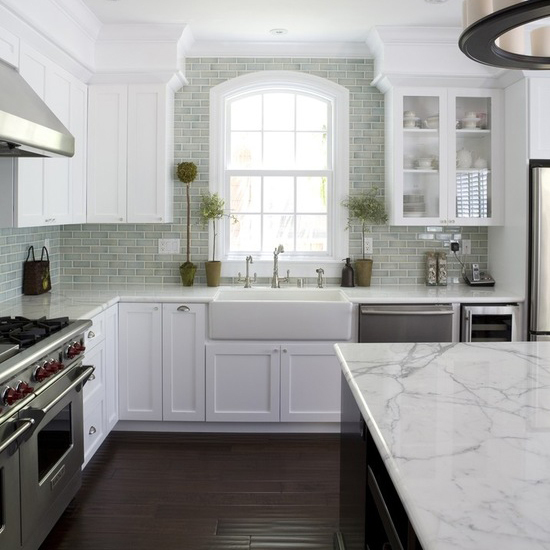 A tile that looks good in the store might not look good in your kitchen. It could be due to different architectural style, size, design and numerous other things. A local tile installer would know the weather conditions and would act accordingly. The knowledge of the climate is important to make tiling durable that can last for years if not decades. The drying process needs optimal temperature that an experience installer would know. Visit your friends or family who have installed tiles recently; you won’t believe how much they can help you in this regard. However, no one understands your needs better than you. But some factual information from others might help you make important decisions. Feel free to contact us for consultation and tile installation in Los Angeles. We would be happy to help you.